What little girl (or boy!) is not fascinated with mermaids?! Did you know you can see real live ones in Florida?! We headed to Tampa for a long weekend so that Sally could meet her new baby cousin, Maverick, and the family could all be together for Passover. While visiting family, we made sure to fit in time for one of our most favorite roadside attractions of all time, Weeki Wachee Springs State Park. Alan's sister recently moved from Jersey to Tampa, specifically to a suburban community along Lake Tarpon. While I wouldn't come from far and wide to see this lake, if you are in the area, there are a number of playgrounds and walkways filled with trees covered in Spanish moss (love that!). Lake Tarpon is huge and apparently a popular fishing lake in the area, but we weren't there to fish, we were there to see family. So in true Harrises fashion, we spent most of our time enjoying Alan's sister's pool and hot tub. But while we were in Florida, we insisted on dragging Alan's family to Weeki Wachee. Long before Sally, Alan and I took a long weekend in Orlando. Why Orlando, you ask? Because we had a free place to stay and it was a cheap way to get a little sun during a particularly cold New York winter. We actually had a blast eating fast food, going to ridiculously huge gift shops, and visiting the Magic Kingdom and Epcot (did you know you can buy and drink beer anywhere in the park?). But the highlight of our trip was spending a day at a small mom-and-pop roadside attraction I discovered an hour outside of Orlando (and just north of Tampa) called Weeki Wachee Springs. We fell in love with this place! Weeki Wachee Springs was started in 1947 by Newton Perry, a Navy man who invented a way to breathe underwater through long air hoses as opposed to wearing a tank on your back. 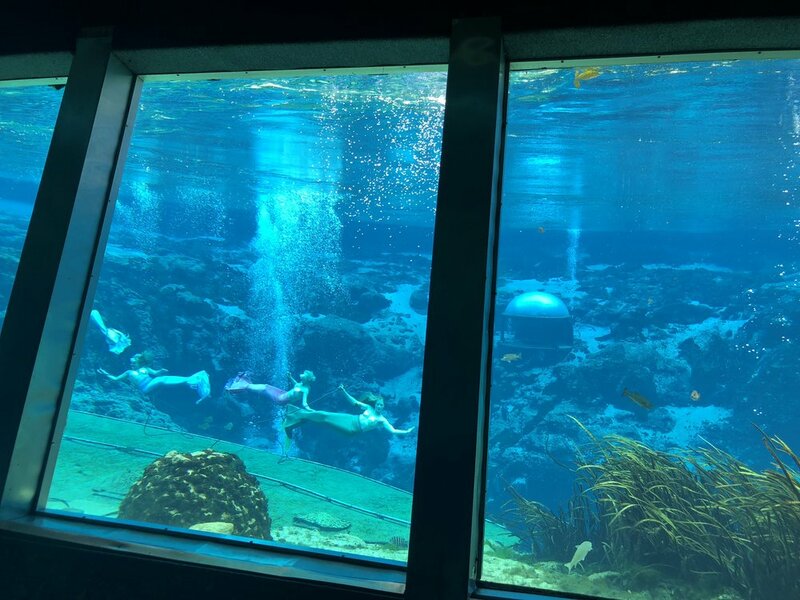 The budding entrepreneur found Weeki Wachee Spring, with its crystal clear water, to be a perfect location for his new business – what would become a mermaid-themed amusement park. He began recruiting young beautiful women to swim in the spring and do various tricks underwater like eating fruit, aquatic ballet, etc. It became a very popular tourist attraction in the 1950s and a 400-person underwater theater was eventually built underneath the surface of the spring in order to view the Mermaid Shows. I'm unclear what modern day mermaid life is like, but apparently back in the day they were held in very high regard and treated like royalty in Florida. And the shows today aren't all that different from what they once were. The show we saw called Fish Tales starts with a brief video history of the park, when suddenly, a curtain opens to the spring and you're quickly greeted by ACTUAL MERMAIDS... well, beautiful women in mermaid outfits sipping air from hoses and performing elegant lip-synced choreography, tricks like eating an apple underwater, and even a rousing patriotic number honoring the good old US of A. The show is an amazing throwback to 50s roadside attractions, and hands-down worth the trip to this off the beaten path park. But wait... there's more! In the 1980s, the park added Buccaneer Bay, a small water park that feeds into the spring that includes waterslides, a lazy river, and a small beach area. There is also a 20-minute river cruise up the Weeki Wachee River, a small wildlife show (Sally got to pet a tiny alligator! ), and plenty of photo ops everywhere you look (including a handful of peacocks roaming the grounds). All this and the mermaid show are included in the price of admission (which is quite reasonable). One more amazing throwback is a super fun souvenir machine from the 1960s called a Mold-A-Rama where you can watch your very own wax figurine of a mermaid riding a seahorse get made right before your eyes. Weeki Wachee is a unique day of pure family fun!